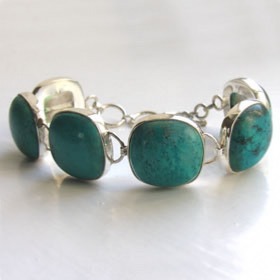 Turquoise has been used in jewellery for centuries. Turquoise is found in Iran, south west USA, Tibet, Nepal, China, Siberia and Europe. The richest sources are Iran, America and Tibet. 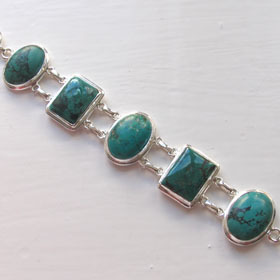 Our turquoise bracelets feature natural turquoise stones. Our turquoise bracelet collection is unique and exclusive to Booth and Booth. 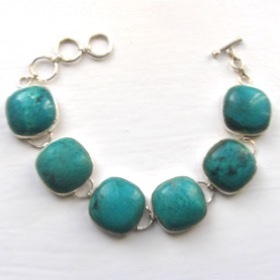 We hand source the gemstones used in our turquoise jewellery. Shop for a turquoise pendant and turquoise earrings to complete your set. Chunky sterling silver cuff inlaid with natural turquoise stones. This wonderful turquoise cuff has been reviewed by Liza Urla of Gemologue. See the photos on our Blog.